In the North and Northwest - is a mountain range: Hoang Lien Son. This mountain area is home to many ethnic minorities. This is also the reason why many tourists visit this region. They then bring to visit some minority villages. This area also has the highest mountain in Vietnam, the Fan Si Pan (Phang Xi Pang). This mountain is located at 3143 meters altitude. (named by the Vietnamese Trung Bo, others Annam) is a mountain range, the Annamite Chain, which runs from the north to the south. This mountain range is in the west, the natural border with neighbouring Laos. In the southwest there are plateaus (Central Highlands) with many waterfalls. Towards the coast the relief decreases and eventually makes way for vast coastal plains with beautiful, unspoilt beaches. In this central part Da Nang is the only place with a good harbour. 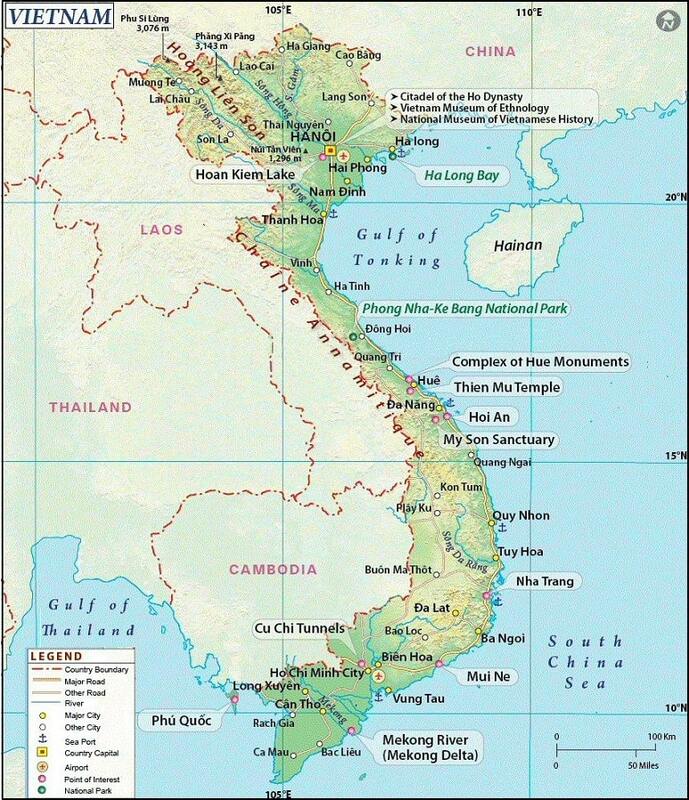 A large part of the southern region (called by the Vietnamese Nam Bo) of Vietnam is formed by the Mekong Delta, a vast lowland area of 40,000 km�. The Mekong River is 4200 kilometres long. Only the last 220 kilometres to go on Vietnamese territory.. The Mekong Delta is a green area with river branches, channels and canals. There is a lot of activity on the water. Transport takes place mostly over water and there are even complete floating markets. The Mekong Delta is a great place to explore by bike. The terrain is flat and a lot of bridges. This makes it for a normal experienced cyclist a chance to explore the Mekong Delta. Ho Chi Minh City (Saigon) is a real metropolis of 7 million inhabitants, with interesting museums (of course about the Vietnam War). A glance at the map shows that the country is vast and with some imagination, the shape of the country resembles the letter "S". From the north to the south the distance is more than 1650 kilometres. In the central part of the land width is hardly 50 kilometres! In total land area is 331 689 km�. In area it is about the size of Italy. The biggest part of the population lives from agriculture and rice is by far the most important crop. The Mekong and Red River deltas are among the largest rice plantation areas of the world. In these areas is often heavy rainfall and rich alluvial soil. On the rice plantations is a 4350 km long elaborate network of dikes, dams, canals, and ditches constructed to provide irrigation and flood control. Peanuts, corn, sweet potatoes and beans are secondary food crops, cotton, jute, coffee, tea and sugarcane are major cash crops produced. 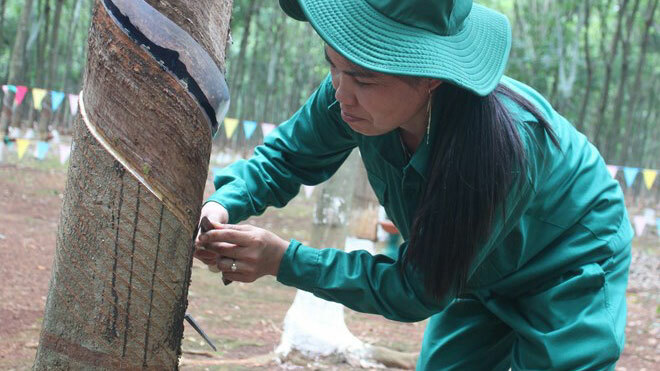 Rubber is also an important export product. Wood is plentiful, especially in the north, but deforestation as a result of new branches in the highlands, cultural displacement and commercial forestry is an increasingly serious problem. The major industries are agricultural processing, engineering, assembly and manufacture of textiles and garments, cement, chemical fertilizers, glass and tires.